Eric D. Eizenga, EMT-P, currently serves as the Merrillville Station Manager and Merrillville 911 Operations Manager for Superior Air-Ground Ambulance Service in Indiana. 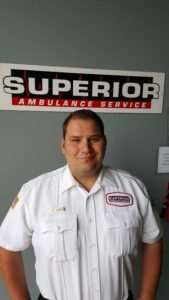 Eric is a dedicated professional with over four years of experience working for Superior Ambulance. Eric began his EMS career by going to EMT school at Advocate Health Hospital in 2012, where he graduated with honors. After graduation, Eric began working for Superior Ambulance in January of 2013. He quickly moved into a position on a CCT ambulance. He soon realized that he wanted to continue developing his skills and taking on new challenges within the EMS profession. In May of 2015, Eric graduated from the accelerated Paramedic program at St. Mary’s Medical Center. Eric then took his National Registry exam and began working as a Paramedic. In April of 2017, Eric started his current position as Merrillville Station Manager and Merrillville 911 Operations Manager . This role provides him with the opportunity to continue his professional development. Eric looks forward to taking on new challenges in this position and hopes to attend CCT school at Loyola in the near future, while maintaining his position as Manager. In his free time, Eric enjoys working on cars and motorcycles. An avid outdoorsman, Eric also enjoys shooting, hunting, and fishing, as well as spending time with family and friends.